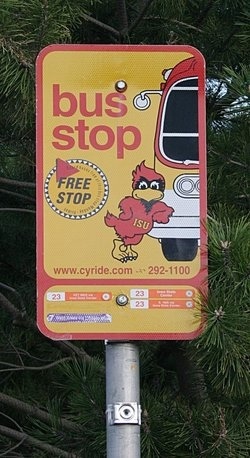 CyRide, bless their hearts, always comes off looking like a mini-jewel among transit providers. By using student workers, they keep operating costs and fares relatively low—difficult to do, by contrast, in big-metro systems with unionized shops. They connect town and gown, which gets them ridership, and students ride free. Any college-town transit company that isn’t catering to students is missing important opportunities to serve people and look good in the process. They also have ticketbooks; unfortunately, they don’t discount them the way they do their pass program (and the way they should). And they have Charles Grassley, who has been a senator from Iowa since Jesus was a carpenter and who can get them big, sweet chunks of Federal money. The cool part? Ames residents are being to asked to vote a design. It isn’t often that buses are treated like a real part of the urban aesthetic, so this is a very nice way to market their new buses.